After want seems like years of build up, a documentary about legendary comic, Bill Hicks, has been finished and out into the world. Often insightful and obviously funny, it should be said that American is in no way a fence sitting approach to Bill Hicks the man, or his legacy. This is a doco made by people who loved him for people who loved him. Its presentation is a unique one. Besides during the bookends of the film, there is no talking heads here, being entirely voice over for the majority by the handful of people included, with most of the story being told via Bill’s older brother, Steven Hicks, friends Dwight Slade and Kevin Booth. The talking presides over photos, home video and plenty of photo animation that is exceptionally done. This approach is novel at first as we learn about Bill‘s childhood, early teen years and his first open mic experiences etc, but it threatens to become repetitive. Just in time though, the film changes gear to include a lot of Bill’s routines that breaks up the pace nicely making the film eventually considerably engrossing. However, in my opinion, non-Hicks fans will probably struggle to get through. It wasn’t made to get an Oscar nomination for example. The film’s greatest benefit is that it will appeal to established fans the most. Perhaps a collection of celebrity inspired talking heads would prove to be a more acute documentary about Bill, but this film is probably as good as a fan could want (besides, the brief It‘s Just a Ride from a few years ago provides that). 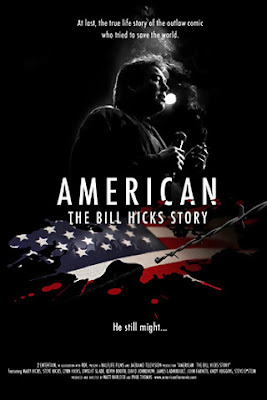 American is, however, without doubt a hundred minutes or so that delves into Bill Hick’s life in a way that has not been done before. It provides insights into his youth and his feelings about drugs and his eventual diagnosis of cancer, without all that celebrity baggage. It is a refreshing approach. Unfortunately, a problem exists within it's method that Bill himself is never shown in an interview in the film. All we see of Hicks is his (some very rare, some not) routines and photos. Obviously a clear decision by the filmmakers, it seems to me a possible mistake not including reactions and/or opinions on moments in time from the man. Luckily everybody else involved prove extremely honest in his or her reflections, but perhaps that missing component is what prevents this unique doco becoming a definitive work. Also, the thoughts of Bill’s father are clearly missed, himself passing away just as filming began. Ultimately, my final judgement is bias given I am a big fan of Bill Hicks and his material. I can say that as a documentary it is slightly lacking, despite providing a sensitive record of his extremely short life. Though not claiming this film provides everything one craves from the idea of a documentary on Bill Hick’s life; it remains informative and highly recommended for fans, but perhaps merely a curiosity for non-ones.